60 Seconds for Archer 60 Seconds for Archer You are an archer and you have only 60 seconds to burst maximum balloons. 90 Second Basketball 90 Second Basketball How many baskets can you score in 90 seconds? 9th Inning Baseball 9th Inning Baseball Write history with baseball and win the championship! Can you handle the pressure of the professionals ? Afro Basketball Afro Basketball How good are in street ball? Show your skills in new sport game and reach the best score. Amigo Pancho 3 Amigo Pancho 3 Brave sheriff Sancho must climb to the top of the cliff and save them. He has only two balloons and your intelligence. Apocalypse Basketball Apocalypse Basketball Play against the apocalypse and against real players in this exciting basketball game. Aqua Bubble Aqua Bubble Shoot the colored balls at the falling balls to make the balls of the same color disappear. Arcade Golf Arcade Golf Play through the 10 holes of this minimal flat golf. Shoot the ball in all the holes with the least hits possible. Arkanoid Arkanoid Arkanoid is a game similar to break out where you move the paddle to hit the ball. Avatar Fortress Fight 2 Avatar Fortress Fight 2 Launch fireballs and more at the other village. Try to take down their dojo by launching weapons. Backyard Mini Golf Backyard Mini Golf Watch out for obstacles as you putt the golf ball around each mini level. Ball Rolling 2 Ball Rolling 2 it's funny physics game,you can draw anything to Get the ball in the glass container. Ballista Level Pack 3 Ballista Level Pack 3 Fire your arrows at the Christmas shapes of balloons. Pop enough of each color to complete levels. Balloon Invasion Balloon Invasion You are the commander of the anti air defense. Enemy is invading with enormous battle groups of bomb armed balloons. Balloon Tangle Balloon Tangle The balloons are tangled up. Your task is to drag them around the board in order to untangle them. Baseball Smashing Car Parking Baseball Smashing Car Parking Try to smash many home run as you can. Basket Avec Nico Basket Avec Nico Throw the ball into the basket and score points. Basketball Heroes Basketball Heroes Make your way through the basketball championships and carry the trophy home. 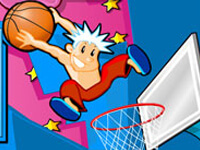 Basketball Jam Basketball Jam Show your shooting skills and score as many baskets as you can before the time runs out. Basketball Jam Shots Basketball Jam Shots A crew of the best basketball players around are here to show off their skills. Basketball Rally Basketball Rally Shoot some hoops throw the ball into the basket and score points. BasketBalls BasketBalls Fun physics game based on Basketball. Batman I Love Basketball Batman I Love Basketball Help Batman to throw the ball exactly in to the basket. Battle Golf Battle Golf Make your angle power just right to hit the golf ball into the hole. Play with 2 at your keyboard. Beach Tennis Beach Tennis The Objective of the game is to hit the ball over to your opponents court and onto the sand to score a point. Big Head Football Big Head Football Choose your character and try to score as man goals as possible against each opponent. Big Joes Homerun Challenge Big Joes Homerun Challenge Play as Big Joe and try to smash as many baseballs out of the park as you can. Billiard Single Player Billiard Single Player Pocket as many balls before time runs out in 8 ball billiards. New rack of 14 balls given when you pocket all balls. Blackbeards Assault Blackbeards Assault Create matches of three or more to get rid of the cannonballs. Blockgineer Blockgineer Engineer the best path for your ball to its destination, a very fun and relaxing physics game! Blosics 3 Blosics 3 Launch balls into stacks of blocks to knock them off the screen! Earn enough points by doing so to progress. Bobs Balloons Bobs Balloons Help Bob to pop all balloons in this cute defense game! Bola Bola Swap two neighboring balls to form groups of at least three of the same color. Brat Baseball Brat Baseball Hit different objects to gain a bonus and top the leader board! Breakit 2 Breakit 2 Control your paddle, break the wall with your ball and catch the bonuses! Building Demolisher Building Demolisher Completely obliterate the structure in each level by using the limited number of demolition balls at your disposal. Building Demolisher 2 Building Demolisher 2 Completely obliterate the structure in each level by using the limited number of demolition balls at your disposal! BunnyLimpics Basketball BunnyLimpics Basketball Pick your team and go for the gold in the Olympic basketball tournament featuring high flying bunnies and real Olympic teams. Captain Steelbounce Captain Steelbounce Nothing can stop your steel balls when it comes to collecting loot.